William R. Mason Regional Park encompasses 345 acres including a 9-acre lake. There are lawns and trees, lots of benches, Hiking Trails, Bike Trails, a Botanical Preserve, Interpretive Programs, Equestrian Trails, Picnic Area, Fishing, an Amphitheater, Baseball Fields, Volleyball Courts, Fitness Course, Horseshoe Pits, Model Sail Boating, Playground Equipment/Tot Lot, and last, but certainly not least, restrooms. Canada Geese swimming at Mason Regional Park. It is a wonderful place to go birding. It has been mentioned in the rare bird alert 99 times in the last 5 years. Rare birds seen include: Palm Warbler, Possible Cackling Goose, Gray Flycatcher, Horned Grebe, Black-and-White Warbler, Red-breasted Sapsucker, Brewer's Sparrow, Plumbeous Vireo, Pacific Slope Flycatcher, The Rose-breasted Grosbeak, Blackpoll Warbler, Lucy's Warbler, Virginia's Warbler, and many more. 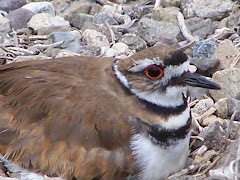 Why is it so often in the OC Rare Bird Alert? Habitat, habitat, habitat. There are lots of trees, lots of grass, and lots of water and it is right next to a large wilderness area--Irvine Open Space Preserve. It's a winning combination as far as birds are concerned: Water, food, and shelter. There is a lot of grass, and there are a lot of geese at Mason Regional Park. There are domestic Egyptian Geese, African Geese, and wild Canada Geese. The "wild" Canada Geese are pretty tame and sit at the edge of the lake less than a foot from people walking by. They get a little uneasy, but aren't in a hurry to move. The African Goose and the Chinese Goose are similar, but the wattle of the African sets him apart from the Chinese Goose. The geese all get chummy regardless of species or domesticity. Mason Regional provides lots of lawn for the geese to eat and mow. They like it. The lake attracts many insects and insect eating birds like the Cassin's Kingbird above. 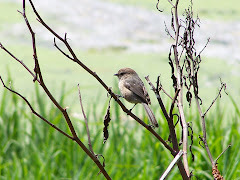 Also seen the day I visited was the Say's Phoebe and the Black Phoebe. Flying low over the lake were swallows, but I couldn't tell you what kind. In the lake were Mallards, American Wigeons, American Coots, Eared Grebes, Pied-billed Grebes, and a Red-breasted Merganser . The Canada Geese went in for a dip after a while. Electric Model boats cruised the lake as well. The lake was full of algae which turned it a thick, green color. A sign near the lake states that they have a project to clean the algae out of the lake which will take about 10 months. Let's hope it's soon. It looks pretty bad. Allen's Hummingbird ruffling his feathers in the sun at Mason Regional Park. An Allen's Hummingbird was perched by the garden and sat there for a long time. The green on his back is more apparent in other shots. Hummingbirds like to perch and watch their territory much like hawks and flycatchers. In fact in addition to flower nectar, hummingbirds eat insects. Say's Phoebe on the way to the parking lot from the lake at Mason Regional Park. Both OC Phoebes, the Black Phoebe and the Say's Phoebe were perched in trees and actively fly catching. There were several Black Phoebes and only one Say's Phoebe that I saw. There are more Black Phoebes everywhere in Orange County than Say's Phoebes. Black Phoebe on the lookout for a meal on the wing. Mason Regional Park has Blue Bird Boxes out in the park. They have been hosts to hundreds of Western Bluebirds. Last year, Mason Regional Park saw 116 Western Bluebirds fledge. 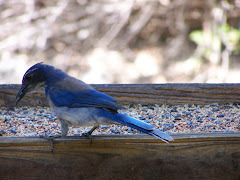 Western Bluebirds are really a really pretty blue and rust color. It is fun to watch them hunt for insects in the grass. There are birds that dive for aquatic plants and fish in the lake, too. There are grebes (Pied-billed and eared) and Red-breasted Mergansers. They were busy popping up and down in the green water. This lake is stocked with fish. Mason Regional Park, a great place to bird. A romantic place to walk. If you cross Culver, you will come to an old barley field that is now 123 acres of wetlands. This is the wilder area of Mason Regional Park. Check out the area in the park brochure. (The PDF file for the brochure may take a few second to load.) 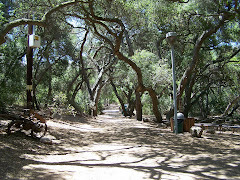 Mason Regional Park is a great place to go birding, have a picnic, take a walk, take your children, have a barbecue. If you live nearby and want a good place to enjoy nature, give it a try. You'll enjoy it. 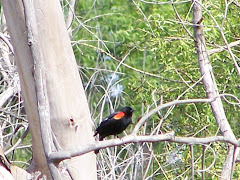 It is a wonderful place for birders to go birding in Orange County. 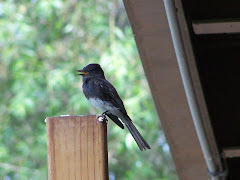 Check out some other great places to go birding in Orange County, California. Not far from Mason Regional Park is this headquarters of the Audubon Society and a great place to bird. Also close to Mason Regional Park is this great place to bird. County park site with information about the park that includes: activities, park brochures, amenities, park rules, and lots more listed in the links on the Mason Regional Park website. The Orange County Rare Bird Alert lists reports of rare birds for the Orange County California area. It daily and weekly summaries. You can search by area such as park or wilderness area, or by species. To find out more about this book and other books, DVDs, and gifts for bird watchers, click the picture about--you will go staight to Amazon.com. And a cute clip from December: ooops! User and Password are "guest" lowercase. Joe,thanks for taking the time to comment. I like hummingbirds myself, and I agree with you that I do need more on hummingbirds. I have been focusing on winter migrants--trying to keep up with what people might be seeing out there. But hummers are definitely on the agenda. Thanks for the great link to your nest cam. Good video. Who would've thought she would build a nest in such a thorny location? I guess it keeps the little ones safe. Stop by again and let us know how the hummers are doing in your garden.